Stress environments hinder the crop growth and development, and under ever-increasing food demand circumstances, concerns of food security have asked for exploring options to overcome such stress conditions. High soluble/exchangeable salt stress referred to as salinity stress resulting from environmental characteristics (i.e., climate and soil parent material) and human-induced factors such as fertilization and irrigation poses serious threats to crop production in saline areas on different extents ranging from low to very high, categorically. This stress affects the plant growth through osmotic stress, which ultimately leads to several physiological disruptions including oxidative stress, nutrient imbalance, and water uptake problems. Subsequently, halophytes gained importance for their accumulation capability leading toward the development of phytoremediation techniques when manipulated through anthropogenic activities. The diversity of halophytes in such conditions offered a huge genetic pool together with wide options for recultivating such saline areas. The variety of halophytic plants also put forward the promising microorganisms associated with such plants helping in ameliorating the stress through various mechanisms, viz., antioxidant and other stress-related exudates production, 1-aminocyclopropane-1-carboxylate deaminase release, chelating agents production, and expression of stress-related genes along with widely understood enhancement of the plant growth through a multitude of processes. Such organisms including bacteria, fungi, and arbuscular mycorrhiza, epiphytic or endophytic, have been reported to enhance the phytoremediation potential of halophytes. 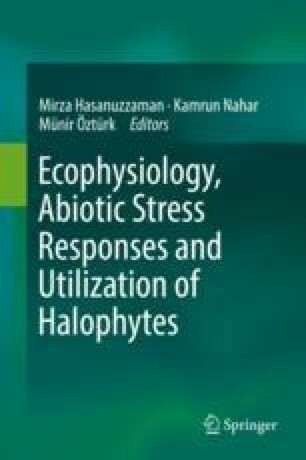 Keeping in view the potential of halophytes and associated microbiome, this chapter will focus on genetic and agronomic potential of halophytes and role of allied microorganisms in enhancing the salinity tolerance and assisted phytoremediation of saline soils.